Day three of ink swabs makes me feel like this is really happening. Only 362 days to go! 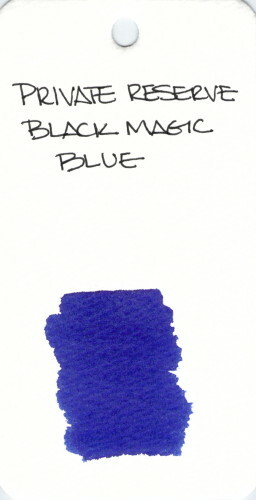 Private Reserve’s Black Magic Blue is an ink I’ve reviewed in the past. Spoiler: I love it. The name doesn’t exactly match the color as I see a bunch of purple in both the swab above and the samples in the review. It’s been awhile since I’ve inked a pen with this ink and seeing it again here is making me hunger (thirst?) for it a bit. Oh, hey, I’m making progress on getting the new site filled in. There’s a fresh About Me page. Check it out. This entry was posted in EVERYTHING ELSE, INKS and tagged blue, ink swab, private reserve, shameless self promotion by Christine (Pentulant). Bookmark the permalink. just an FYI I don’t know how to fix it but I’m still getting blog updates via email (subbed previously) but the body of the email is the notice of the new URL. I’m hopefully going to fix the subscription by subscribing via this comment but not sure how your end looks. Uhoh. Are you saying that you’re getting notifications from the old blog? If yes, you’ll need to unsubscribe there and resubscribe there. There are definitely some growing pains going on here. So glad I scheduled everything to happen over the holidays. Thank you for hanging in there. Ok so I have nooooo clue what WordPress is doing when it’s sending me the new blog post notification updates, and then showing me the “we’ve moved to .com URL” sort of page that is in the body of the email. The move (and content as always!) is a good one, and yes, stupid growing pains!